Once, in Soviet times, in the literature on the psychology of the family described in the case study family therapist. The couple always argued how to cook the sausages. One spouse said that it is necessary to remove plastic wrap before cooking, and the other, respectively, claimed that you need to cook in the foil so that the sausages don't seethe. The confrontation came to the point that they turned to a psychologist. However, it did not help - after three months of living together and heated debate about the sausages, the couple broke up.The article aims to dot all the "i" in such a simple, seemingly, as being cooked sausages in order not to repeat this curious case. The first option of cooking sausages. Remove the plastic film from the sausages. If sausage in a natural casing, it is not necessary to remove. To sausage without film when cooked still guaranteed not to burst and not seethe, it is possible to make a few punctures with a fine needle. 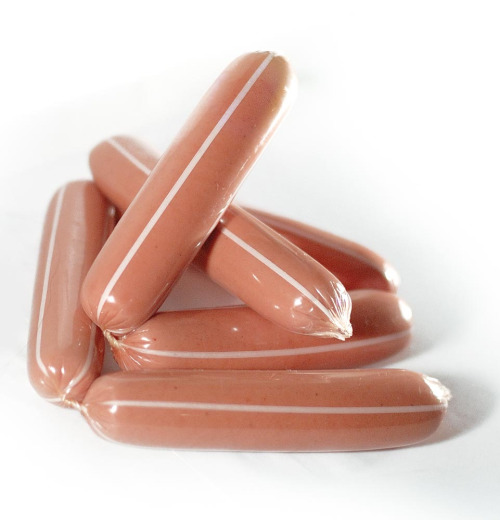 Put sausages in a saucepan, cover with cold water so that the water covers them by about 1-3 cm. For a brighter taste, you can pour the sausage is not water, and tomato juice - then they will get a very spicy, almost exquisite taste. Put the dishes on a medium heat, bring to a boil. When water (or juice) to boil, allow the sausages to cook for another 2-3 minutes, not more - otherwise they will be digested and lose taste. Immediately after cooking, remove sausages from water (tomato juice). Similarly, you can cook sausages in the microwave. With only one difference - pour sausage need boiling water and not cold water. Cook at maximum power for 3 minutes. The second option of cooking sausages. Peeled from the film sausages , place in a steamer or on a grate in a pan for roasting. Cook the sausages for a couple about 10 minutes. These sausages turn out very tender and juicy. The third option is the easiest. Sausage with removed cellophane wrap just put in the microwave that are included on the lowest power for 3 minutes. In fairness, I must say that the boiled or roasted turned out sausage, cooked this way, nobody can. Among professional cooks, it is believed that sausage is the finished product and they do not have to cook at all. And the fact that they commonly brewed - a matter of taste and habits. Sausages are a mix, which before its consumption must be boiled. This can be done in a pot of water, and in a slow cooker, steamer and even a microwave. Special rules for making sausages do not exist. In any case they are cooked, if you throw them in boiling water. However, there are some recommendations that will help to make the sausages more succulent and tasty. The semi-finished product may be enclosed in a plastic sheath and are natural. The first is easy enough to remove, if it is carefully make an incision from the edge and pull. Natural casing can be difficult. It is considered more environmentally friendly, but to remove it is not so easy, and eat a sausage with it not very hygienic and tasty. If you bought sausage in the plastic shell before boiling be sure to remove it. Product in genuine "clearance" before cooking enough to pierce with a fork in several places, so they do not burst. For cooking sausages, you should take a small pan, fill it water and put on fire. The product can be cast both in cold and in hot water. However, if you want the sausage retained its flavor, put them in boiling water. Salt it is not necessary. After 5-7 minutes the sausages are ready to eat. To increase the cooking time is not recommended because the product may lose not only your taste but also presentable. In microwave oven the product can be boiled in just 3 minutes. Thus it is necessary to select the maximum capacity of the furnace, and hot dogs must be in containers with water so that it completely covers them. The cooking time of the sausages in the steamer is not more than 10 minutes. For this you must place the mix in a special bowl and turn on the steamer for 10 minutes. Gourmets claim that sausages, steamed, have more saturated taste and aroma. 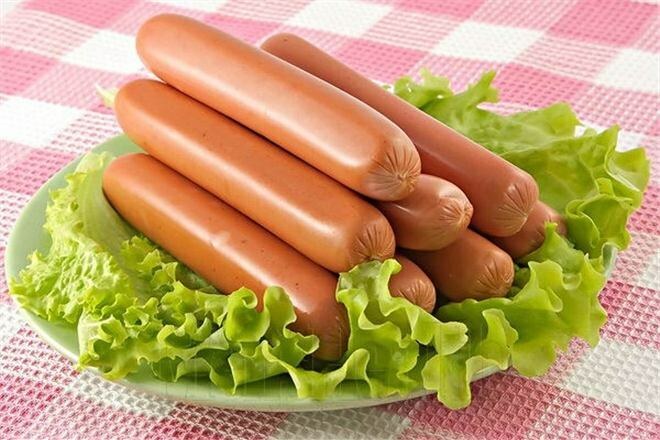 For the preparation of prefabricated pour into the bowl multivarki water, place hot dogs. Select the program "steaming". Put the timer on for 10-15 minutes. The countdown will start after boiling water. The most common garnish for boiled sausages are pasta. With them also combines lettuce, tomatoes or mashed potatoes. Meals with sausages can be safely complemented with a variety of sauces, such as tomato, cheese, soy. You should not write off from accounts and mustard.